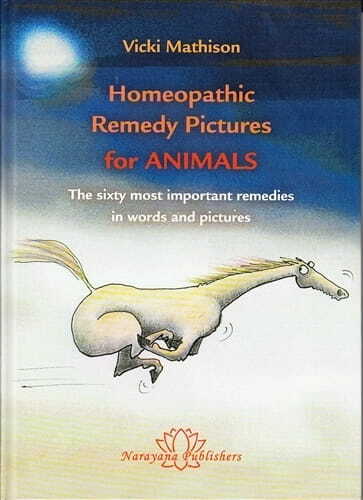 The origins of this book as a study aid during the author's veterinary homeopathic training explains the simplicity of the content and the close correlation with currently available materia medica, particularly Robin Murphy's. Vicki has aimed at condensing the information into a recognisable picture of how an animal might present when in the remedy state, alongside lists of the strong modalities and indications for the remedies. However, when information is condensed there is always a danger of bias and omission; for example, there is no sign of the loquacity of Lachesis or the suddenness of symptoms and all or nothing nature of Phosphorus. I was also surprised that the book claims to represent the 60 most important remedies. There will of course always be a certain amount of subjectivity with any ranking of importance but I personally found the omission of the Kali salts (other than Causticum), Phos acid and Calc phos for example, with remedies such as Asarum and Theridion in the 60 chosen, a little misleading in terms of the most commonly used and important remedies in veterinary homeopathy. However, the book does provide an easily readable and attractive study aid and will be a prized book for animal lovers interested in homeopathy as it is far more accessible than a classical materia medica. The illustarations are very attractive and add to the book's appeal for the animal lover and visually biased indivual and make this book more likely to be picked up and read as a coffee table book. With few good texts available on rememdy pictures in animals this book definately has a place. When I was asked to write this review, a dear friend and colleague was staying in my home in the final run up to her homeopathic examinations. She used this book extensively and found it a useful aide memoire, being simple to read and relate to after hours of heavier reading. This book does make you want to open it and before you know it you have refreshed your knowledge - I have just read through her account of Asarum and I can honestly say that before reading Vicki's book I had quietly forgotten this remedy altogether!